¡Cantar! (Sing!) 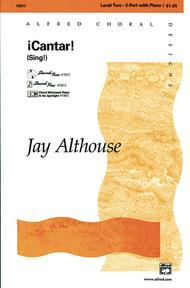 composed by Jay Althouse. Choir Secular. 2-Part Choir. Choral Octavo. Choral Designs. Latin; Multicultural; Secular. Choral Octavo. 12 pages. Published by Alfred Music (AP.19311)."¡Cantar!" is a stylistically authentic salsa work for choir. The text is a combination of English and simple, repetitive Spanish phrases set to a rhythmically infectious melody. Enjoy this new SSA voicing of Jay’s #1 seller! Sizzling!Inst. Parts Available (choral); Recorded Acc. Available; Spanish Publications.About Alfred Choral DesignsThe Alfred Choral Designs Series provides student and adult choirs with a variety of secular choral music that is useful, practical, educationally appropriate, and a pleasure to sing. To that end, the Choral Designs series features original works, folk song settings, spiritual arrangements, choral masterworks, and holiday selections suitable for use in concerts, festivals, and contests.